Few presidents have faced the kinds of challenges Donald Trump has had to face every day. From the unprecedented attacks on a Supreme Court nominee to caravans heading towards our southern border, lesser men would have buckled and given in to the political and national security pressures this president has confronted. Thankfully, Donald Trump is the strongest leader America has had in decades, taking decisive action where his predecessors displayed timidity, and his strength is just what America needs at this time in our history. Americans knew they were voting for a fighter with Donald Trump. The intensity he showed on the campaign trail in 2016 translated to dogged determination in domestic affairs and steadfast poise in the international arena ever since. In fact, polls show that the American people recognize this strength. Enticed by the siren calls of American open borders activists and reassured by the active or passive encouragement of prior administrations, tens of thousands of people are marching to the American border en masse right now. These “caravans” are merely the most visible manifestation of a decades-long tragedy of crime, trafficking, and death on our southern border. But both the caravans and the wider crisis actually stem directly from American weakness in the past. President Trump’s predecessor, Barack Obama, for instance, instituted a “catch and release” program for border enforcement that gave a pass to illegal immigrants breaching our border. These executive actions directly encouraged countless more illegal immigrants — many of them unaccompanied minor children — to make the dangerous trek northward from Mexico and Central America. That weakness ended when President Donald Trump took office. Faced with the massive humanitarian crisis posed by mass illegal immigration, he responded with “zero tolerance” policies, pledges to send the military to protect the border, and more recently, plans for tent cities to house offenders. President Trump has also vowed to end the misguided practice of “birthright citizenship” that is based on an erroneous reading of the 14th Amendment. That confident strength is equally evident in President Trump’s dealings on the world stage. The American people elected a deal maker who would fight for their place in the global economy, and he hasn’t disappointed. Canada and Mexico were used to being given the kid-glove treatment from the Clinton, Bush, and Obama administrations. President Trump brought them back to the table to get a better deal for American workers, replacing the disastrous NAFTA deal with one that gives American manufacturing a fair shake — the U.S. Mexico Canada Trade Agreement. President Trump’s strong stand on trade has also led to a new trade deal with South Korea, but ultimately, the real target is our great rival China. The Washington establishment was aghast when President Trump used his national security authority to introduce tariffs and other protections for American workers against unfair Chinese trade practices. They warned of a “trade war” and other horrors, but we now stand on the cusp of a major breakthrough with that country. Prior administrations tried to bribe China to play fair, letting the autocratic state join the World Trade Organization and opening our borders to torrents of cheap Chinese goods. This fecklessness handed the Chinese Communist Party untold American jobs and piles of cash to expand its global influence and threaten the free world. President Trump has ended that era of weakness on China, too, and when the dust settles, we will finally compete with China on a free and level playing field. Similarly, Donald Trump ended nearly two decades of presidential dithering by officially moving the U.S. Embassy in Israel to Jerusalem. Despite a congressional mandate and their own stated commitments, successive administrations reneged on the promise to move America’s embassy to Israel’s historical capital for fear of angering the perpetually-aggrieved Palestinian extremists. President Trump recognized that keeping the embassy in Tel Aviv did nothing to mollify the terrorists, but represented an ongoing insult to Israel, one of America’s most loyal allies. President Trump has also demonstrated strength through restraint, most impressively with his measured response to the outrageous, contrived assault Democrats unleashed on Supreme Court Justice Brett Kavanaugh. When Kavanaugh was threatened with ruin, infamy, and disgrace merely so that Democrats could try to control the Supreme Court with only a minority in the U.S. Senate, President Trump stood solidly behind his nominee, insisting that Kavanaugh would ultimately be vindicated by the process, as indeed he was. It’s a sad commentary on American political culture that another president likely would have withdrawn Kavanaugh’s nomination, denying him not only a seat on the Supreme Court, but also the opportunity to clear his name. A more timid president would have hung Justice Kavanaugh out to dry in order to save his own reputation — President Trump instead burnished his reputation by refusing to let the Democrats destroy Brett Kavanaugh. Rather than fretting about offending a particular voting block, President Trump has done what he felt was right, to the greatest extent of his constitutional authority, and trusted that the people would see the wisdom of his decisions. 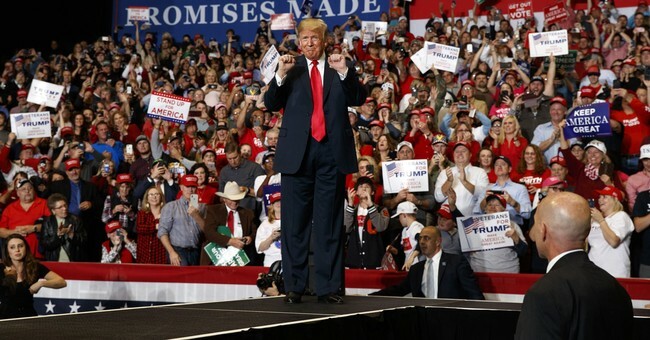 Where traditional politicians vacillate on difficult issues, Donald Trump has shown remarkable strength and initiative, which has proved especially potent as the President has overturned political and strategic norms at home and abroad. The timing was right for America. Donald Trump is the right man for the job with the strength we need. Bay Buchanan is former U.S. Treasurer.